The LEED Gold-seeking 18,000 square foot Sun N Fun Wellness Center was designed for a Florida resort looking to provide new services to attract the baby boomer generation of residents. The project’s goal was to connect to the existing pool and create an “open” feeling by taking advantage of views to the east. Full glass facades on the east and north provide large amounts of natural light and views outside. The building utilizes large overhangs on the south side to shade the against the harsh Florida sun, and it incorporates additional green building systems including a 10,000 gallon rainwater recycling cistern, a state of the art cooling system, and lights which are controlled by occupancy and daylight sensors. We are proud to announce that Sun N Fun is LEED BD+C GOLD Certified! Our 11th LEED Certified project! The LEED Gold-seeking 18,000 square foot Sun N Fun Wellness Center was designed for a Florida resort looking to provide new services to attract the baby boomer generation of residents. The project's goal was to connect to the existing pool and create an “open” feeling by taking advantage of views to the east. Full glass facades on the east and north provide large amounts of natural light and views outside. 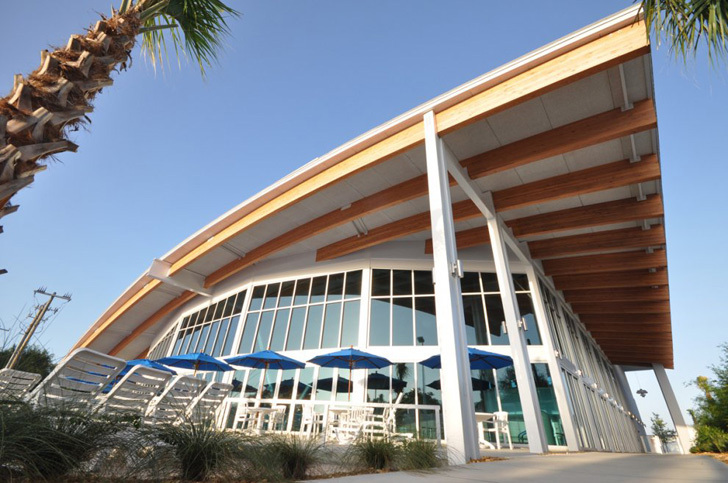 The building utilizes large overhangs on the south side to shade the against the harsh Florida sun, and it incorporates additional green building systems including a 10,000 gallon rainwater recycling cistern, a state of the art cooling system, and lights which are controlled by occupancy and daylight sensors.